Later: Considering the title, I took this book to be a memoir, not a history or official anything. I took it to be thoroughly biased to Shavit’s point of view and agenda. This is part of why I originally gave it a rating of 9.5 and still might go back to that. 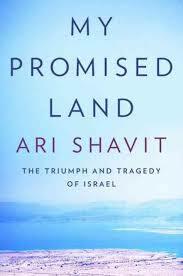 With My Promised Land it seems Shavit has set himself the elusive, complex and extraordinarily difficult goal of answering some rather existential questions about Israel, a seriously threatened country which is, at the same time, occupying another people and their land. Shabit is looking for answers to such questions as “Why is Israel? What is Israel? Will Israel?” within the context of its history as filtered by his own personal life and journalistic experience. In some ways it is very disappointing because to me (with limited knowledge and less experience) much of the thrust is still basically pro-Zionist. On the other hand, I think it may be a very realistic portrayal from an Israeli point of view – quite patriotic but still pinpoints the times and place(s) where Israel went awry and the thinking which got them there. **Note – if you read this, get past the glorification in chapters 1 through 4 and read especially chapters 5 and 11. Overall the book is excellent but the it took some time for me to appreciate it because Shavit’s chronological perspective is so very well done – and I’m not sure I agree with him on the beginnings – don’t really know. The narrative is brilliant, switching from present tense for a base in the story at a given time, to past tense for prior to that time and occasionally future for after that time. Then he switches the present tense for the next segment of the story again going to past and future for info before and after this new time. It’s fascinating to read while also being beautifully and naturally executed. In the first chapters Shavit introduces the reader to some very early immigrant settlers who brought Western and European culture, ideas and technology along with them including, possibly, some of the worst ideas of the lot, superiority and colonialism. And for most of these folks, settling in the barren northern areas was mostly a very positive experience. Some of these heroic immigrant Jews were very wealthy and bought up large tracts of land while others received backing from the Rothschilds, a tidbit about which precious little is said in this book. By Chapter 5 I’m disgusted. If this is Liberal thinking then there is no hope. The Zionists’ motives and early efforts are portrayed as almost totally honorable and heroic – “benign.” Certainly no one went there with the goal of making big money; it was always for noble reasons or personal safety. He highlights the “elite” with attention given to their usually very difficult lives prior to coming to Israel. To the few who actually foresaw a struggle the solution was always to move the Arabs and others out so the Jewish population could live in peace. After all, it’s just a little country and all they want is peace. Right? Mercifully, it’s Chapter 5 which opens Israel to enormous criticism. Taking over small northern villages is one thing, but simply obliterating the entire city of Lydda because it was in the wrong place is another. It is, says Shavit, the “black box” of Israel and his depiction shows why – all the bad things to follow came out of that black box of Lydda. Chapter 7 is about Israel’s attaining the atomic bomb – the rationale, the opposition. Israel, throughout this whole period was becoming a nation of warriors. And then comes the necessity of the occupied settlements in Chapter 8 and detention camps in Chapter 9. Not pretty, not heroic, not inspiring, but brutal and oppressive, the comparison to the Nazi camps is not denied and it’s hard to read stuff – it was probably hard for Shavit to write, although from what I understand he’s been doing this for many years. As the chapters roll on the story becomes more revealing of Israel as it is today with the difficulties between the parties and issues – hawks and doves, Liberals and Conservatives, secular and orthodox Jews snd, somewhat different, the ultra-orthodox Jews*, Ashkenazi and Oriental Jews, the PLO and the peace process, Palestinian and other refugees. This is great reading – Shavit is open about who he is and what he believes, but it seems each faction he touches on, no matter how different the views, is treated with respect. 2000. Chapter 13 includes a sample of the Muslim-Israeli experience. Chapter 14 introduces the reality of today, the politics, the wars and strikes and turmoil, including Iran and their potential war capabilities. Chapter 15 includes an uprising by the middle class who seem to be getting squeezed out along with another romantic Jewish success story. And Chapter 16 is more information about the reality of Iran’s nuclear capabilities and how it may be too late to avoid war. Finally, Chapter 17 is a summing up, looking both backwards and forwards. In this chapter he reiterates the dilemma of maintaining a Jewish identity in an open world – the tragedy it would seem is that we no longer live in a world where that identity can be preserved and the connections to the 21st century maintained. It’s not a bright and happy ending, but it feels real. Wow, this is an impressive review, Bekah, you’ve tackled one of the most vexed questions in contemporary geopolitics and I thank you for it. It sounds like a book I should try to read, for the same reasons as you have. Thank you, but there is a great deal of controversy about the book. Many people, many Israelis I guess, do not like it a bit. It was apparently written for Americans with the attitude of fatalism and “we made mistakes but now what?” I don’t know – I may have missed something. I’ve added a bit of a disclaimer to my original review. Have to see how the discussion at All-nonfiction turns out. Oh sure, I gathered that from your review. But whatever the book’s flaws, if it starts a conversation that’s good. I’m fairly sure it will get a discussion – heh. I just bought The Idea of Israel by Ilan Pappe, also new on the market which takes a very different view – anti-Zionist, I think.